My work has had me traveling a lot to Daytona Beach to meet with a collaborator at Embry-Riddle Aeronautical University, and it’s always a bit enjoyable traveling down there (usually via Orlando), since while I’m not always the biggest fan of large metro areas, the greater Orlando area has a lot of things going for it. First of all, it’s a distinctly different climate (half of the year, that’s an advantage). Second, it has a relatively good selection of ethnic restaurants, especially for things like Cuban food and Southern food that aren’t really around in NH. And, on this trip, it was also a good opportunity to meet up with fellow traveler, in this case Leslie from My Adventure Bucket. While she’s often away touring the world in the way only a retired funeral home director with a random number generator can, for our visit, she was still in town prepping for an extended trip to Sri Lanka. So, after arriving in the early evening, we decided to meet with Leslie at a nearby joint: The Gnarly Barley. 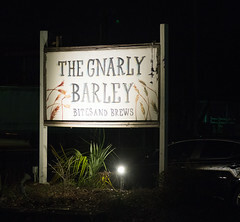 The Gnarley Barley is, foremost, a “joint”. 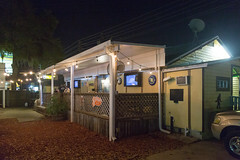 Located in a small almost shack-like building on Orange Ave, walking in, it’s immediately obvious that it is a “beer joint”, with a bar, an impressive tap list, and bar-style seating. There’s a certain vague boundary between “bar with food” and “restaurant with beer”, but Gnarley Barley is definitely on the “bar” end of the spectrum, not that there is anything wrong with that. After getting flagged down by Leslie as we walked in, I was soon relaxing with a cold Cigar City beer while perusing the menu. 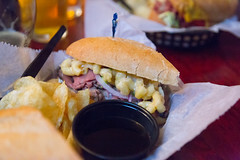 The menu at Gnarly Barley isn’t any fancier than the place itself: it’s basically a few snacks, tacos, and sandwiches. But hidden in that “sandwich menu” along with basic cold cut selections and a few BBQ subs, there was one little item that stood out (and was recommended by Leslie): the Johnie Mac n’ Cheese. This was basically a variant of the classic French Dip (which I always have a weakness for), with a nice pile of fairly rare roast beef piled up on a toasted sub roll with some onion…. and a hefty layer of mac and cheese added on top of all that (myself, opting for the jalapeno version). “Pasta” and “au jus” is a bit of a weird combination, but you know, it actually works, and it works well. Flavorwise, each bite was a bit of mac and cheese, a bit of zing from the jalapeno, a bit of crunch from the bun, and a nice hit of juiciness from the jus. I’d happily return to have this again (as I suspect Leslie has several times). So, if you’re looking for a great place to stop for a relaxing beer and a great sandwich after arriving at MCO, well, The Gnarly Barley is an excellent choice. And many thanks for dinner, Leslie, and I didn’t even need to “die” for this one.